Another wonderful review Matt – keep us posted on these crazy scope deals! The C90 Mak arrived at my door last weekend and I’m very pleased with it so far (e.g. design, mechanics, optics), although I’ve only tested it in a couple of short observing sessions (in light-polluted skies) so far. Replaced the erect-image diagonal with an Orion dielectric mirror diagonal. Focused stars show perfect concentric Airy disks. With it’s high power capabilities, I’m hoping to see more than just 2 bands on Jupiter (which my small, faster scopes can only show) and detect component E (and possibly F) in the Trapezium under darker skies. 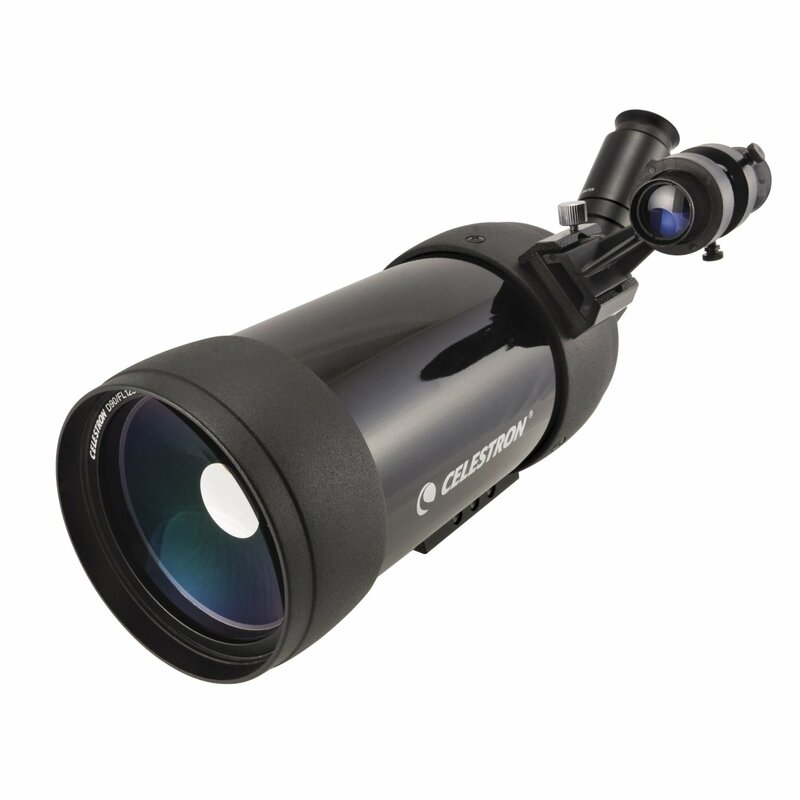 Also, the C90 Mak comes under the Celestron No Fault Limited Lifetime Warranty, which applies to all of its spotting scopes. Focused stars show perfect concentric Airy disks. That’s what I’ve been loving about my Apex 127. Looking at double stars at high magnification is a real treat: perfect little discs surrounded by perfect little rings of light. I haven’t used my XT10 in a while…it will be interesting when I go back to it to see how much the diffraction spikes bother me. OTOH, I use it mostly for deep sky, not bright stars, where diffraction spikes are less of a problem. What will be really interesting will be comparing the XT10 and Apex 127 on planets. The XT10 has double the aperture, so once it’s well collimated it should blow the Apex out of the water. BUT I’ve read in several places, including Ed Ting’s site, of smaller Maks throwing up a more pleasing image than mid-sized reflectors, especially if the seeing is so-so, which it often is around here. The thing is, Maks don’t require frequent recollimation, and the Apex is pretty close to dead nuts on. I think the XT10 would have to be collimated within an inch of its life to equal the collimation on the Apex. Which is one of the reasons I got the Apex: not only is it a convenient size and weight, it’s no hassle keeping it in fighting trim. Oddly enough, I just caught E and F for the first time last night, in the Apex 127. I think you’re right about hunting for them under darker skies, they were small and dim enough that both background sky glow and seeing impacted my ability to see them. Should be doable in a 90mm scope, though, especially if it’s well collimated. If you don’t mind, please report back when you’ve attempted both experiments. 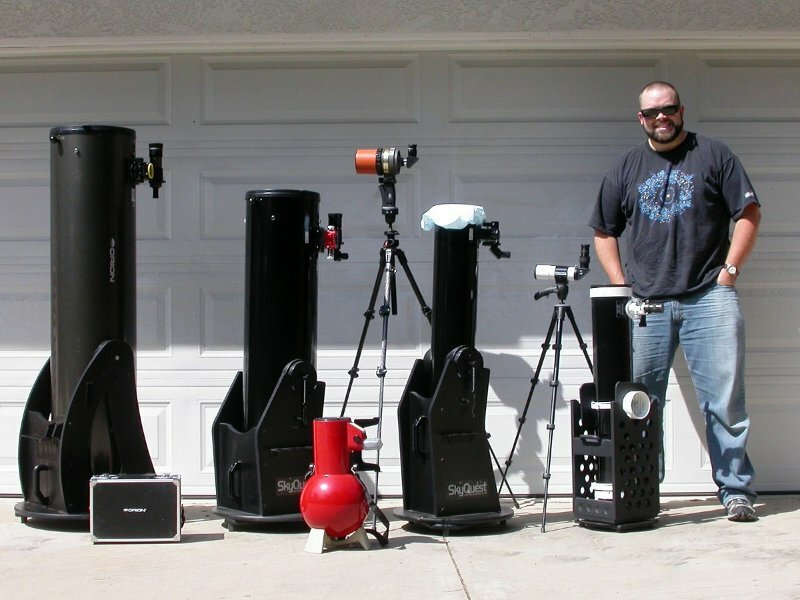 I’ll do the same for the SkyWatcher model when it comes in. I don’t have much experience with viewing planets (except maybe Jupiter), but Mars looked good in both the C90 and ST80-A earlier tonight from my light-polluted driveway – could see a dark marking in the center of the disk in both. Don’t want to compare between the two scope views because I didn’t have both scopes out at the same time. Will let you know how my C90 performs on Jupiter, the Trapezium, and on DSO’s (the latter compared to the Skyscanner) when I take it to my suburban “orange” zone site next week.. .
Have you used the backpacker 90mm yet? If so, how would rate it? Also, can the scope be moved manually with this mount, or do you have to use it motorized? Thanks. Have you used the backpacker 90mm yet? If so, how would rate it? Not yet, but it’s supposed to be delivered later today. If so, and if it stays clear, hopefully I’ll be able to post a first-light report soon. 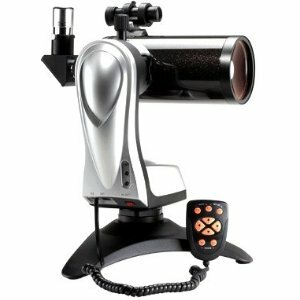 The tube is the same model as the Orion Apex 90 that I used to own, just sold under the SkyWatcher brand. That Orion 90 was outstanding, and most reviews of it have been very good. Still, there is some sample-to-sample variation, so I’m very keen to see whether I got another winner. Maks have a reputation for sharp optics because all of the optical surfaces are spherical, which makes them easier to grind and polish to the correct shape than the parabolic curves and more complex shapes associated with other telescope designs, and because the central obstructions from the secondary mirrors are small. But as with almost all telescope types, occasionally a dog gets through. Also, can the scope be moved manually with this mount, or do you have to use it motorized? Thanks. This I don’t know, and I’m very keen to find out. Obviously the mount is a lot more useful if it can be used manually in addition to motorized, but I haven’t read enough reviews of the mount to have come across that information. I have a manual light alt-az mount I can move the scope to if I need that capability, but it would be great to have both modes available in the mount that it comes with. This is one of the things I’ll be sure to report on. Thanks for your interest. I’ll answer your questions as soon as I can. Time never drags as slowly as when one is waiting for a new telescope to arrive! Thanks, Matt, for the Mak tutorial, re how the lenses are made. Very informative, even encouraging. I’ve heard that the 90mm Maks are exceptional scopes, but that because of the small field of view it is difficult to find and center objects, even at lower mags. Have you found this to be the case? Yes, it would be great if you could move this scope manually, but somehow I doubt this can be done, that you would break or otherwise screw up the gears (which are likely plastic) in the motorized mechanism. Still, worst case, I guess you could find a nice compact tabletop mount and just use it that way, as with the Orion StarMax which, as you say, has outstanding reviews. I am thinking about ordering one of these from Amazon, but think I will wait until you post your first light report, which I eagerly await. Thanks once more for sharing your expertise. Matt, last question for the moment. Promise. I have only been at this for maybe 5 weeks, and bought my first serious scope, an Orion StarBlast 6, barely a month ago, so I ask for your forbearance for what must seem naive questions. I live in Oregon,so in the month I have had the StarBlast, I have had exactly 3 clear nights, hence my progress is slower than I’d like. That said, I am intrigued by these smaller Mak scopes and see a real place for them, even at my sub-newbie stage. I am, as in the previous post, worried about being able to find anything in such a narrow field of view but see enough difference, re viewing experience between a Mak and my SB 6, that I am seriously thinking about getting one of these 90mm Maks. Ok, that final (for the moment) question: Are the optics the same in the C90 and Starwatcher backpacker 90mm scope? If not, is the C90 the superior scope, and by how much? Thanks once more for your patience. Thank for your interest–we have lots to discuss! First off, you chose an excellent instrument for your first telescope in the StarBlast 6. My own first scope was a 6″ Dob, the XT model, and I learned a ton from it. I really think scopes in that class hit the sweet spot for combining good light grasp, reasonable portability, and affordable price. That said, a smaller, more grab-n-go-able scope makes a nice complement to a mid-sized reflector like your StarBlast. My own second scope was a little Mak and I used it for all kinds of things I’d never tried before: flying with a telescope, looking at birds and other wildlife during the day, and, most rewardingly, doing sidewalk astronomy. I’ve heard that the 90mm Maks are exceptional scopes, but that because of the small field of view it is difficult to find and center objects, even at lower mags. Have you found this to be the case? It depends. The 90mm Maks have a maximum true field of view (TFOV) of a little over 1 degree. In contrast, your StarBlast 6 has a much wider maximum TFOV. In the StarBlast 6, a 32mm Plossl would give an apparent field of view (AFOV) of 52 degrees, a magnification of 23.5x, and a TFOV of a hair over 2 degrees (TFOV = AFOV/magnification). But I’ll bet your StarBlast 6 came with 25mm and 10mm Plossls, right? Which should yield 30x and 75x and true fields of 1.73 degrees and 0.7 degrees, respectively. Usually you would use the 25mm as a “finder” eyepiece to get objects located and centered, and then crank up the magnification with the 10mm to get a better view. And for finding objects, that 1.73 degree field is very useful. I think all of the currently available 90mm Maks ship with 25mm Plossls (UPDATE: nerp, according to Amazon the C90 comes with a 32mm Plossl, which is kinda nice). Given those scopes’ longer focal lengths–1250mm versus 750mm for your StarBlast 6–the 25mm Plossl will yield a higher magnification–50x–and a smaller TFOV of almost exactly 1 degree. So to me the questions are, first, how much does a 1 degree field limit you in finding objects, and second, what can you do to overcome it? On difficulty finding: there is no doubt whatsoever that when you’re starting out, just getting the telescope pointed at the desired target is the hardest part. Or at least that was true for me, and seems to be true for most beginners. And in that case the extra true field in a shorter focal length scope is very helpful. On the other hand, if you observe regularly, you’ll rapidly get better at getting the scope on target and finding objects in the eyepiece. And 1 degree is still a fair chunk of sky, and you’ll probably end up spending a lot of time with the StarBlast 6 looking at true fields smaller than that (when you’re using your higher magnification eyepieces), so you’ll get used to it. On overcoming a narrow true field: as soon as you can afford it, get a big finder. I consider something like a 6×30 RACI about the minimum for an optical finder, and a 9×50 is a whole lot nicer. Big finders don’t just get you pointed in the right general direction, they can often get you completely on target before you ever even go to the eyepiece. 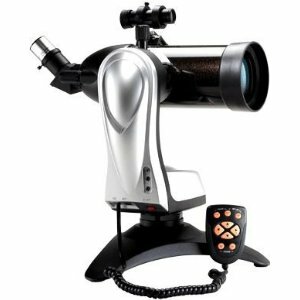 People have seen the entire Messier catalogue in 50mm instruments, so if the sky conditions are good enough you could potentially get the scope lined up on any Messier object using nothing more than a 9×50 finder, and have the object already waiting for you at the eyepiece with no more “finding” necessary. So: will it be harder to locate objects in a 90mm Mak than in the StarBlast 6? Yes, somewhat, especially at first, but not impossible. Should that stop you from getting one? Not necessarily. I’d only had my first scope for about three months when I got my first little Mak, and I learned almost as much from the smaller scope as I did from the bigger one. The bottom line is that telescopes are tools, observing with them is a learned skill, and you will get better with practice–and only with practice. I think you’re right. The scope came in today and I’ve been through the instruction manual for the mount and there doesn’t seem to be any provision for unpowered operation. Are the optics the same in the C90 and Starwatcher backpacker 90mm scope? If not, is the C90 the superior scope, and by how much? The Orion and SkyWatcher 90mm Maks and the C90 are all made by Synta and they’re all 90mm f/13.9 Maks. As far as I can tell, the only physical difference is that the Orion and SkyWatcher models have straight tubes and a slightly less bulky back end compared to the C90. But the optics are probably coming out of the same factory to the same physical tolerances. The only difference I have been able to find is that the C90 is advertised with multi-coated optics and the plate on the SkyWatcher OTA says “coated optics”, which means that the C90 has better anti-reflection coatings on the meniscus corrector lens at the front of the tube. That probably improves light transmission by a few percent and might help reduce glare a bit. Another factor to consider is that Celestron considers the C90 a spotting scope, not a telescope, so it comes with their no-fault lifetime warranty, which is better than whatever warranty comes with the SkyWatcher scope. Balanced against that is the fact that for only the difference in shipping costs, the SkyWatcher scope comes with a mount. That is a huge plus for the SkyWatcher, unless you’ve already got something sturdy to put the C90 on or could knock something up yourself. I ask for your forbearance for what must seem naive questions. Bah! Everyone’s a beginner sometime. I started this blog with the ambition of helping people into the hobby. If it’s actually serving that purpose, then I’m honored. Jeez, Matt, I expected a few sentences worth of reply and was delighted to read what amounted to a treatise on Maks and lenses and eyepieces. I have already bookmarked this for future reference. Thank you!!! Although I have only been able to have it out twice, I am loving my StarBlast 6. Just a superb scope: easy to use, what seem to my neophyte eyes excellent optics, and wonderful aesthetics (I just like to look at it from time to time). Pretty easy to transport out to the back patio, but not really a grab-and-go. More a lift-and-haul. It’s only 23 pounds, but still kinda cumbersome. You are spot on, re the eyepieces that came with it (Sirius 25 and 10). I added Orion’s 2x Shorty Barlow and their Expanse 6mm which I noted in one of your comments somewhere on your blog has become a sort of default DSO ep for you. Looks like I chose wisely. I figured out on my own to start off with the 25mm on any object, then gradually work my way through a higher mag progression. But sometimes the 25 is just fun to leave in there and scan the sky randomly, drinking in all these sections that to the naked eye are empty black sectors, but with the 25mm are star-gorged celestial jewel boxes. I just ordered a 15mm SVA lens and #56 blue/green filter from Agena, so I think I am pretty well kitted-out now. In the interests of full disclosure, i originally ordered a StarMax 90 from Orion back in January, thinking it would be an ideal first scope for a raw beginner. I tried it out twice and couldn’t find anything, so I sent it back and got the StarBlast 6 which I am much, much happier with. But, as you correctly say, practice is what you need and even now at higher mags with the SB 6 which has the same field of view as the StarMax at lower mags, I can get around pretty well, So maybe I have now grown into a small Mak. Hey, actually AHEAD of you, re the finderscope! From what I’ve read, people either love or loath the red-dot fnders. Put me in the latter group. With my SB 6, all but impossible to use and requiring uncomfortable and frustrating head and shoulder gymnastics and I never seemed to get the damn thing aligned. So I ordered a 6 x 30 RACI from Orion (the rep I talked to said that they recommended the 6 x 30 for scopes 6″ or smaller). SO much easier to use. Big, bright viewing circle, razor sharp crosshairs, easy and fast to adjust precisely. I tilted it to the left so that its ep is at the same angle as that in my main viewing tube, so now I lean over slightly, line up the object, move my head back about 6″ and, wham, there the object is right in the main viewer. I just posted a review on Orion for this unit. Maybe I should have gone with the 9 x 50 but this smaller one seems to work fine, plus it sits up a bit higher so the main viewing tube doesn’t get in the way when I am hunched over the finder. I am pretty sure I am going to get one of the two Maks, most likely the StarWatcher that you got. Great-looking little rig and it comes with a nice base and motorized tracking capability for the same price as Orion’s StarMax 90. 10-Minute is a great blog. Keep on posting! Hello, I am a nature photographer. My name is Yanno. 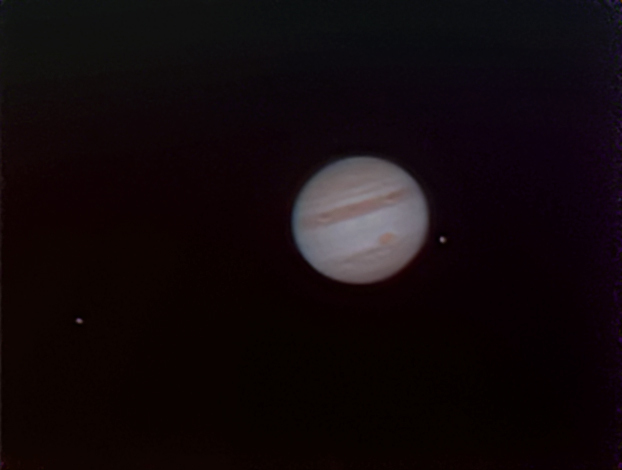 Since the 80’s, last century I used the Celestron Maksutov C90 lens for nature photography with great results. Right now, 2014, on a Sony alpha 65 body the same old lens works great.. I had to buy an adapter for it. So what. One thing. The Sony Alpha 65 body has to be adjusted by one click and that is all. Macro photography, no problem. Mid range photography, no problem. Taking a photo of a guy who is smoking a cigarrette at a 65 km distance outside an powerplant, no problem. My advice: Always use a tripod and watch the weather conditions, the reason why is that much humidity in the air makes bad photo’s.